Circumstances have many in the auto industry scrambling to embolden product fleets with vehicles obtaining higher gas-mileage ratings and lower emissions, yet still providing the performance drivers have come to expect—especially the pickup-truck sector. Automakers are seeking the right combination of engine, drivetrain, powertrain and driveline components, to provide combinations that will deliver optimum driving performance and mileage ratings. For one automaker that combination includes a high-strength, lightweight “banjo” rear axle for use in its two-wheel and four-wheel-drive truck models. A banjo axle typically is constructed using stamped, high-strength components welded together to form an axle housing that can reduce the mass of the part and, therefore, vehicle weight. With time constraints a factor, and to avoid potential interruptions to production cycles, the powertrain engineers for the automaker sought the assistance of the 3-Dimensional Services Group, a Rochester Hills, MI-based rapid prototyping firm that specializes in design, engineering and analysis, inhouse tool construction, and complete build of first-off parts and low- to medium-volume production runs. With the automaker seeking parts and components for crucial testing deadlines and final review decisions, 3-Dimensional Services began its work on the rear-axle housing. The housing consisted of nearly 30 individual stampings, with many structural components fabricated from high-strength sheet steel at 4.5 mm thick, others from 1008-1010 carbon steel. With a 10-week delivery timeframe, work began quickly, with only the part design provided to 3-Dimensional Services. The number of parts, quality checks and processes involved in completing the axles left open the possibility for multiple delays. In addition to the axle halves, other stamped pieces included baffles, front and rear backing plates, rear cover, front mounting ring, strengthening gussets, numerous brake cable guides and hose brackets, harness brackets, spring seats and reinforcements, shock brackets, drain plug inserts, and pipe brackets. The large upper and lower halves of the axle were formed in its 1600 ton press, one of 44 presses the firm employs. 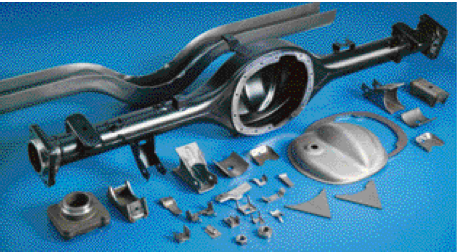 The stamping operation was sped along by the use of both Kirksite and aluminum alloys for die materials. After the stampings were completed, some of the components, and in particular, the upper and lower housing halves, were laser trimmed using some of the company’s 13 five-axis laser cutters. With the forming and laser trimming completed, the main section halves were welded together using the company’s robotic-welding stations, then each end of the housing was bored using one of the company’s large, bridge-style Awea three-axis machining centers featuring a 120 by 63-in. travel envelope and supplemental two-axis rotary fixture to accommodate the press fit of the wheel hub forging that was furnished by the automaker’s forging supplier. The next process: Assemble the hub forgings and weld them in place, then weld the miscellaneous brackets to the housing. Following the welding-certification inspection, each assembly underwent leak testing and CMM dimensional inspection. With quality approval of these still-in-process axles, the assemblies were sent out for electrocoating, then brought back for final machining of the forged flange hubs, including hub diameters, bushing seal surfaces and ABS sensor mountings. After machining, the company performed a final CMM inspection.